It’s been quite a while since I've done an update on the metal printing front, so I thought I'd do an update of where we are. In my last blog post I set out about choosing a low melting point metal which would have some unusual properties which would help with printability - mainly choosing a temperature which would minimise damage to our traditionally printed plastic components on to which our metal would be deposited, and also using a non-eutectic to attempt to minimise the effects of surface tension. One of the main problems I previously had was solubility. Running molten metals were acting as solvents for my heated nozzle - resulting in the nozzle slowly dissolving during a print. At the end of my last post I'd just tried using anodising to create a strong oxide layer on the surface of an aluminium nozzle to protect it, and that the results were promising after little running - I've done hundreds of hours printing since and as far as I can tell no damage has been done and its still in its original condition. I'd anticipate that a stainless steel nozzle would also be useable as it also has a strong oxide layer. Previously the plastic and metal were printed on separate machines. Anyway, I've heavily modified my X carriage to take one Bowden extruder (for the plastic) and one "standard" extruder for the metal such that I can (in theory) do one shot printing. The metal extruder is fairly standard, the only major modifications are the inclusion of an O ring to reduce leaking, and running the PEEK insulator right to the end of extruder to minimise the melt zone - the result is a slow extruder - I'm currently printing track at about 100mm/min - but hopefully one which we have the most control over. I printed the above about a month or so ago. 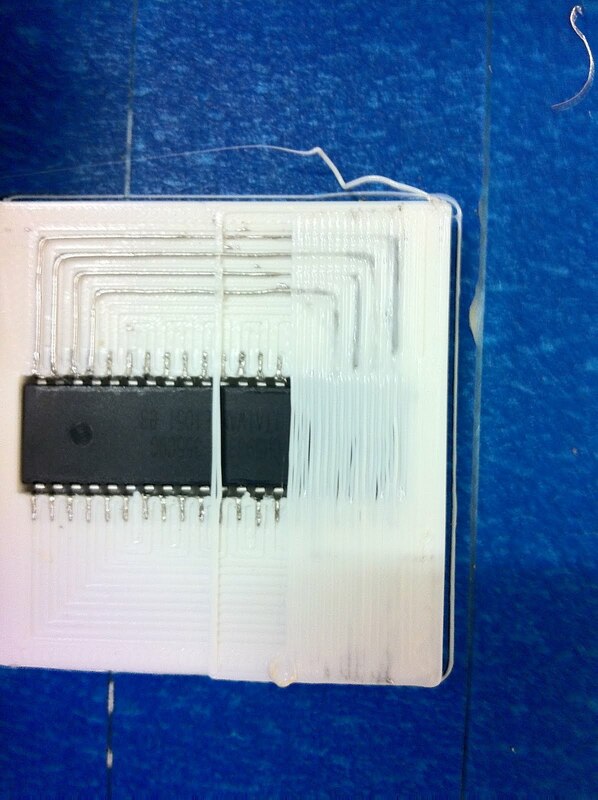 The plastic housing contains a female hole for supporting an ATMEL644P PDIP chip, as found in our Sanguino electronics. The metal tracks are housed within 0.7x0.25 rectangular channels. Surface tension would suggest that the metal would naturally want to take a circular cross section - however given the size of the track I'd be unable to get anywhere near this hence the rectangles. The component was inserted into the plastic and the metal track automatically deposited on top before being covered with more plastic. Importantly we can see that the plastic extruder isn't excessively melting the metal tracks when covered. Myles has got the mixer nozzle (see here) working! 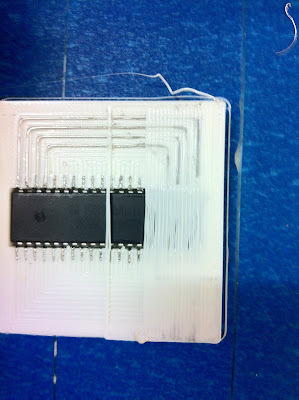 The two filaments left and right were mixed to print the component in the middle. (Myles says sorry for the lousy iPod photos.) The mixer is now active - it has a small DC motor turning a stirrer in the brass hot end to churn the melt up, and that seems to do the trick. Next stop - full five-colour operation!